I don’t have the time to film a bookshelf tour and probably won’t until summer comes around since I’ll be away at school again starting next week, but I figured while I was at home I could snap a few pictures for you guys to show you my bookshelves. I have the big white shelf organized with my big series on the top two shelves (so Gossip Girl series, The Clique series, A-List series, and all my Jen Calonita, Joanna Philbin, and Lauren Conrad books). After that everything is organized alphabetically by last name all the way up to the last name Shannon. The rest of the alphabet is on the brown shelf’s first and third shelves. 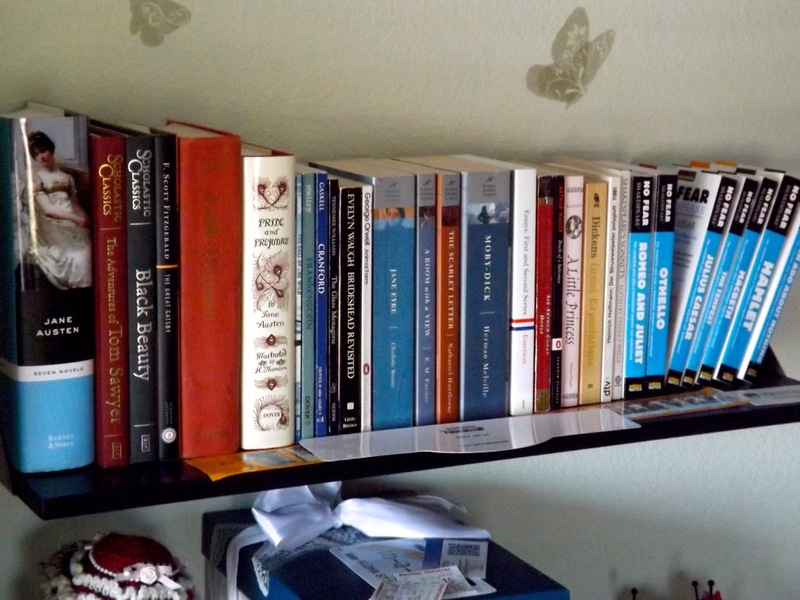 The second shelf on that one has all my Agatha Christie mysteries and a few other mystery authors. The fourth shelf has my Fruits Basket mangas and my Hunger Games companions (along with the Hunger Games itself!). The very bottom shelf has childhood books and the one above that has some misc. mass market books and photo albums. The last shelf all by itself has larger sized classics and the very top of my white shelf has mass market sized classics along with my Harry Potter boxed set.